One thing I’m enjoying about Series 11 is the variety of places on Earth we’re visiting. Russell T Davies’ Who was London-centric and Moffat tended towards geographical vagueness, but so far this year we’ve been to Sheffield, Alabama, the Punjab, and now Lancashire, with the specificity making each of these diverse settings feel more tangible. This is a particularly exciting one for me, because Pendle Hill isn’t far from where I grew up. Based on this series’ sensitive treatment of history and culture so far, then, and given writer Joy Wilkinson is a Lancastrian too, they were inevitably going to treat my county with respect and not come up with a town name that sounds like a medieval sewage dump. So the Doctor and friends land in Bilehurst Cragg... oh... ah, well... and soon find themselves embroiled in the Pendle witch trials. Adventure ensues. My main impression of The Witchfinders is the same simple point that summed up Kerblam! – it begins with a concept that’s thoroughly well suited for Doctor Who and tells that story well. Every character has something to do, there’s clear plotting, a clear theme (the witchfinders as bullies of women) and a clear tone (Hammer-esque camp, spooky horror). All this allows it to flow in a pleasant way that makes for one of the most rewatchable episodes of the series. This level of basic competence perhaps shouldn’t be remarkable, but given four out of the first five episodes of this series were irritatingly messy, it does feel remarkable how much it’s raised its game since Chris Chibnall passed the baton to his team of guest writers. A few aspects elevate the episode above basic competency, though, and the first is the most brilliant piece of Doctor Who guest casting since Kylie Minogue played a waitress on the Titanic. The role of King James I (VI to the Scots) must have looked odd on the page, not particularly necessary to the plot and with some rather dramatic dialogue that could easily make for the most cringeworthy guest character since James Corden played the Doctor's mate James Corden. But the invincible Boris from GoldenEye more than pulls it off, treating every scene with the same flamboyant sense of fun with which he pissed Chibnall off by being the only person to leak a single detail about this series’ plots. Every scene with him is brilliant, right down to the way he camply flaps his cape when sitting down in a huff. I’m no monarchist, but King James is now a queer icon. The other major strength of The Witchfinders is its treatment of gender. No episodes so far have really shown Jodie Whittaker’s Doctor being treated differently because she’s now a woman, which may have been wise to start with so as to let her cement herself in any doubters’ minds that she is the same Doctor we’ve known for twelve previous incarnations. But the show had to address this issue at some point or another, and there may not be a more appropriate story with which to do so than this one: it’s about a historical atrocity committed specifically against women, which was long enough ago that the Doctor almost becoming a victim of it can be treated with some levity rather than feeling distasteful, but which allows for some nevertheless relevant dialogue about misogyny. James’s patronising attitude towards the Doctor and declaration that “the general can’t be a woman” before being proved otherwise seems to me a metatextual comment on the backlash to Whittaker’s casting, another aspect of this episode that could have been clunky as hell but is judged with enough subtlety and sits right within the episode’s wider themes. It definitely helps that The Witchfinders has a female writer. 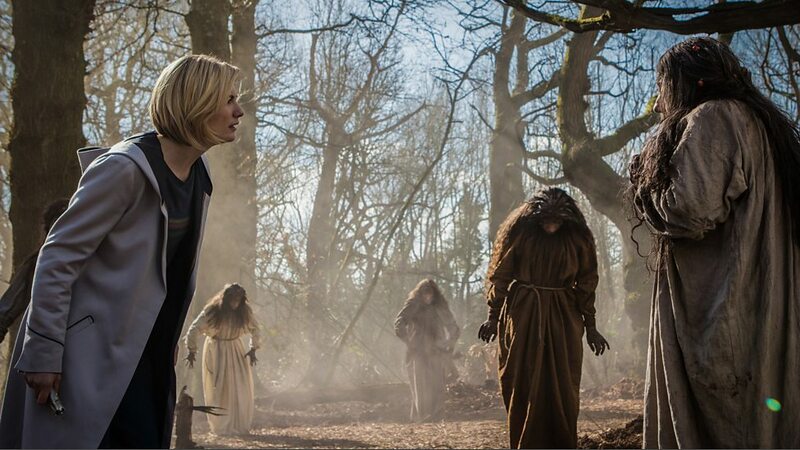 Indeed, letting a Lancastrian woman do an episode about the Pendle witch trials shows off a major strength of Series 11 – guest writers have been given lease to write stories reflective of their own experiences and culture, with the consequence that Rosa, Demons of the Punjab and this have all felt like they have something to say, in a way that individual episodes of Moffat’s Who much less frequently did. It makes me excited to see whether the same team will stick around for the next series or whether Chibnall will bring on even more diverse recruits. Female director, too, for those of you counting, and I like what Sallie Aprahamian did here. The finale could have been bland and exposition-heavy, but feels like a proper Hammer movie showdown, visually punchy, while the desaturated brown and green colour palette makes for a nice rural horror atmosphere. 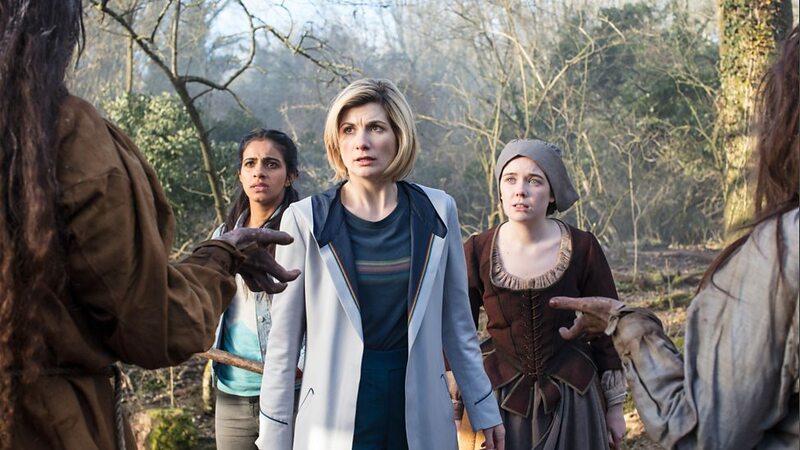 Every episode this year has had a distinct and cinematic look, another strength of Series 11; the bit of Wales that played a Lancashire forest this week probably isn’t far from the bit of Wales that played India two weeks ago, but through considered grading and sound design, they’ve both felt like Lancashire and India respectively. That said, does the Doctor’s trial scene feel oddly put together to anyone else? The reliance on close-ups means that the companions and James have to stay on the same spot, which is weirdly static, and that the geography is unclear. And if you don’t see what I mean by that, try drawing a map of where all the action in that scene takes place. I bet you struggle. But anyway, another very strong episode all around. And let’s not forget Graham in the big hat. Laughed every time I saw it. I am really thankful to read your content. andClash Of Clans MOD APK thank you for sharing with us.